Between the beginning of the ‘ceasefire’ (00:00 on 02.15.2015) and yesterday mid-afternoon, Russian-terrorist forces have been grossly violating the [latest Minsk] agreement, by repeatedly shelling the positions of Ukrainian troops and civilian targets. After the beginning of the truce, the first strike was carried out by terrorists on the night of 02.15, from positions in the area of Stakhanov (where a battery of howitzers opened fire). Since mid-afternoon yesterday, the enemy, in addition to attacks from almost all types of weapons, has also made repeated attempts to resume the offensive. Ukrainian troops are only opening fire in retaliation. 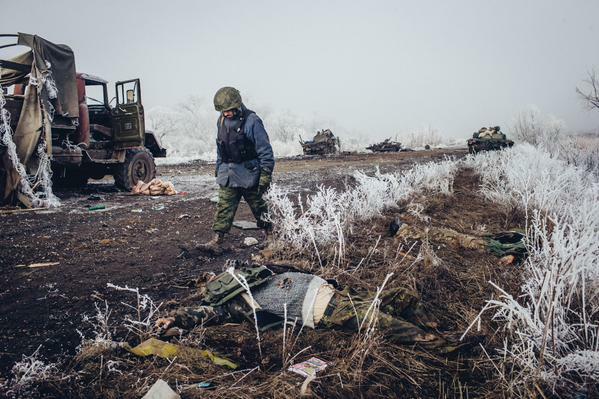 The most difficult situation is in the Debaltseve springboard. In particular, several attacks on Ukrainian troops were reported near the village of Chornukhyne. In Novohryhorivka, enemy formations tried to surround two Ukrainian checkpoints. In the course of that attack, a terrorist tank detonated a mine (and was finished off by grenade launcher strike). While Ukrainian troops were repelling the attack, one enemy IFV was struck with an ATGM [anti-tank guided missile] (the crew was destroyed). Also, artillery positions in the vicinity of Shakhtarsk (12 units of cannon artillery and 6 MLRS units) delivered fire on the positions of Ukrainian troops in Debaltseve. Temporary insurgent checkpoints were set up along the Snizhne – Donetsk motorway, blocking civilian vehicle traffic in the area of Russian-terrorist troop artillery positions (in order to prevent any photo or video coverage of the attacks). Meanwhile, the enemy has been regrouping their forces. Two battalion tactical teams of Russian-terrorist troops were deployed to the area of Horlivka, reinforced by a separate armored group (a total of about 900 people, 25 tanks, 32 armored combat vehicles, up to 20 motor vehicles, two mortar batteries, 2 batteries of cannon artillery – 6 D-30 howitzers and 6 MT-12 anti-tank guns). Multiple instances of firing on the positions of Ukrainian troops were also recorded in the Donetsk and Luhansk areas over the last few days. The enemy was using small arms, mortars, tanks, cannon artillery, and MLRS. Over the past weekend, the enemy attempted attacks in the area of Mariinka. An attacking enemy group was stopped by the flanking fire of Ukrainian troops, and forced to pull back to its original lines. An explosion took place at the local police department in Horlivka. Several insurgents were injured. According to preliminary data, the explosion was caused by careless handling of an RGD-5 type grenade. An unusual convoy was spotted moving from Donetsk through Snizhne, towards the Russian border. It consisted of seven jeeps, one BTR-80, 12 armored buses with tinted windows, 6 covered ‘Ural’ trucks, and an open pickup truck with a heavy machine gun in the back. The convoy moved at a high speed without stopping at checkpoints. 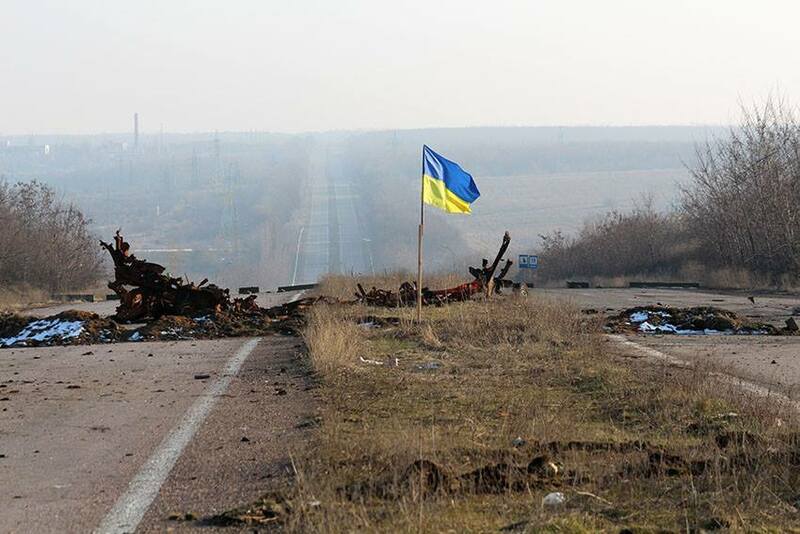 Ukraine’s Ministry of Defense shared this photo yesterday (February 15, 2015) of the last checkpoint before Russian-held territory. 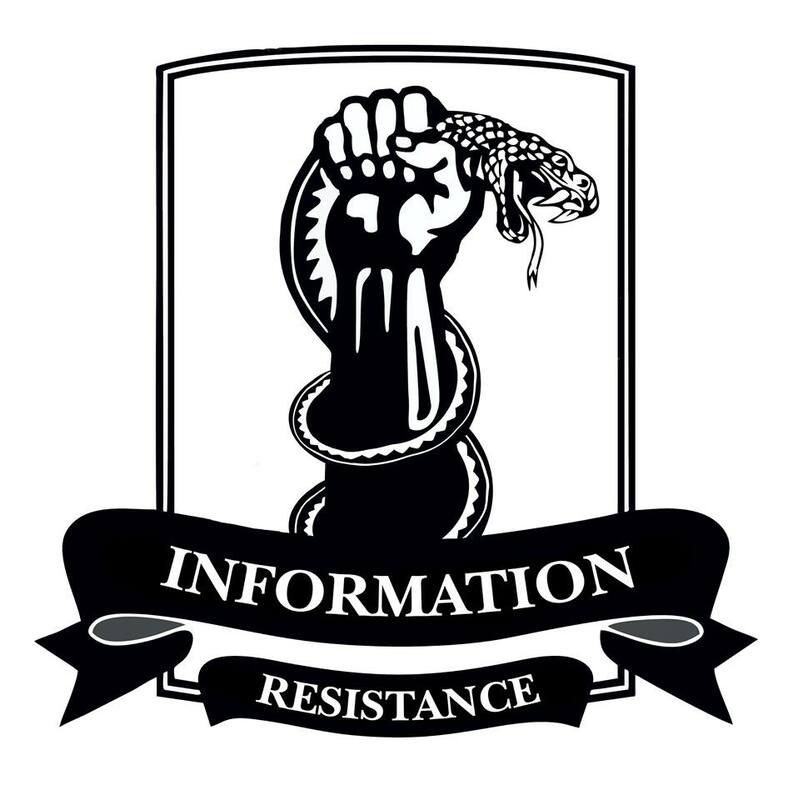 This entry was posted in Dmitry Tymchuk, English, English News, South&Eastern Ukraine, War in Donbas and tagged #Minsk #ceasefire, #RussiaInvadedUkraine, #StopRussianAggression, #UkraineUnderAttack, Dmitry Tymchuk, Information Resistance, Ukraine. Bookmark the permalink.